RTÉ RADIO ONE’S flagship news programme Morning Ireland remains the most listened to radio show in the country, despite dropping listeners over the past year. The latest radio listenership figures for the last quarter of 2017 show that Morning Ireland had a daily listenership of 423,000 people – making it the most listened to radio show in the country. This is despite the fact that it dropped 25,000 listeners when compared with the same period last year. In total, RTÉ said that its stations reach just over two million listeners, with 53% of people aged 15 and over tuning in every week. This is an increase of 112,000 year-on-year and 8,000 book-on-book (as in, last quarter). Despite this, Radio One saw drops almost across the board in listenership for its weekday programmes. Liveline with Joe Duffy had 373,000 listeners daily, down 14 from last year but up 3,000 from the last quarter. Meanwhile, at 2FM, Breakfast Republic was at 186,000 listeners, up 32,000 in the year (but down 3,000 book-on-book). There were rises in listenership at 2FM for most of its weekday programmes. “This is the fifth consecutive book in a row that 2FM has seen increases,” said Dan Healy, head of radio strategy and 2FM. Stations take two years to recover and we’ve beaten our nearest rival Today FM for the second book in a row, increasing the margin by 13,000 in three months. RTÉ’s weekend schedule also had a boost, with Saturday and Sunday Sport shows increasing their listenership by 49,000 and 51,000 people respectively year on year. Sunday sport now has 224,000 daily listeners across the day. Meanwhile, over at Communicorp, Newstalk had a mixed result, with some shows dropping listeners and others gaining. Newstalk Breakfast had 119,000 daily listeners 0 down 2,000 book-on-book and down 3,000 year-on-year. Pat Kenny was at 143,000 – a drop of 4,000 year-on-year. It is now close to 170,000 listeners behind RTÉ’s Today With Sean O’Rourke. Despite this, Sean O’Rourke had a drop of 20,000 listeners year-on-year. Moncrieff meanwhile had 82,000 listeners – up 2,000 book-book and 9,00 year-on-year. The Hard Shoulder with Ivan Yates also had a boost 9,000 listeners to 139,000. “We are very pleased with Newstalk’s performance, as outlined in today’s JNLR figures, which shows that Newstalk’s weekly reach has risen to 754,000, an all-time high for the station representing an increase of 63,000 listeners across the last year,” said Chris Doyle from Newstalk. At Today FM, Ian Dempsey’s Breakfast Show was at 160,000 listeners, dropping 7,000 year-on-year. Fergal D’Arcy also increased his listenership by 5,000 to 102,000 in the last quarter. The Last Word with Matt Cooper also saw a slight rise of 2,000 listeners year-on-year to 134,000. 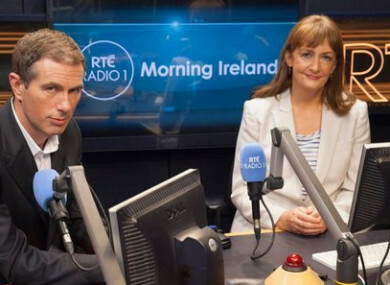 Email “Despite dropping 25,000 listeners in a year, Morning Ireland is still by far the most listened to radio show”. Feedback on “Despite dropping 25,000 listeners in a year, Morning Ireland is still by far the most listened to radio show”.